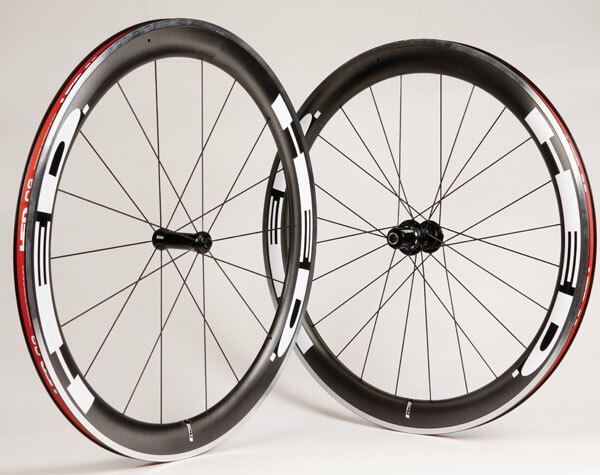 The basis for these wheels – and all Hed’s non full-carbon rimmed wheels – is the C2 rim profile also found as a stand-alone item in the Ardennes wheels. It is to these fully structural aluminium rims a 1K-carbon 55mm deep aerodynamic fairing is bonded. This fairing is shaped to the same dimensions as the Stinger range of carbon wheels and as such benefits from Hed’s SCT profile. Designed to be very stable in changeable and cross wind scenario’s, HED’s rounded profile was the forerunner to the plethora of similar shapes that are now available. Aerodynamics aside for a moment, the 23mm wide rim is about 4-5mm wider than a standard aluminium rim and as such the tyres can be run at approximately 10% lower tyre pressures for the same feel. The larger air chamber offers the same support for a given weight of rider and subsequently offers a reduction on rolling resistance – see separate box. In order to keep the price down, the Jet 5 Express wheels loose the carbon fibre inserts in the hubs used on the more expensive FR wheels. There is also a slight spoke down spec: CX-Rays are swapped for Sapim’s – still bladed – Express. The trade off is a minor weight penalty of just under 50 grams for similar depth wheels, and a saving of £200. By the time you read this, the testing will be well underway so watch this space to see how it performs, and also how it fairs against the best in our recent wheel review. Rolling resistance is massively affected by tyre deflection so the width of a tyre has a huge impact. Given the same carcass construction and inflation pressure a wider tyre will have a shorter flattened contact patch than a narrower one. As such, less defamation occurs, and there is therefore lower rolling resistance. This article was first published in the April 19 issue of Cycling Weekly. You can also read our magazines on Zinio and download from the Apple store.